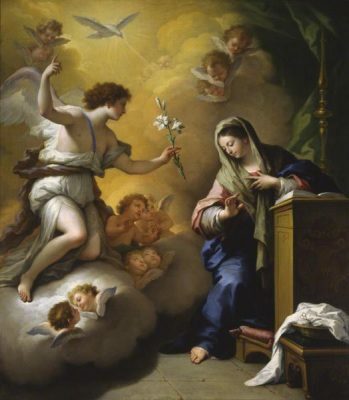 Solemnity of the Annunciation of the Lord - My Catholic Life! The Feast of the Annunciation is the reason why we celebrate Christmas on December 25. 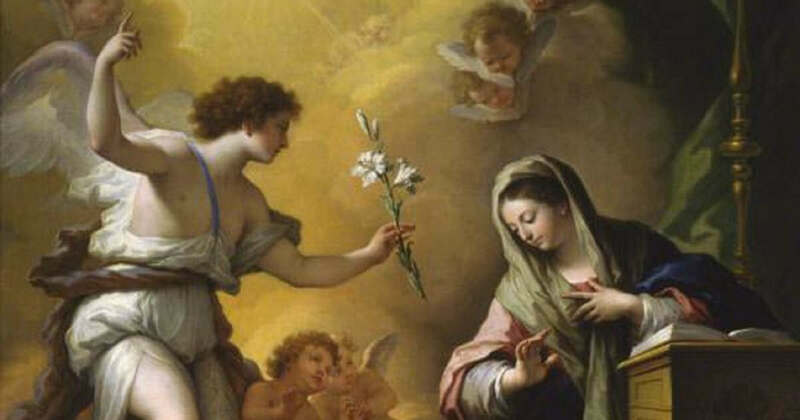 Christmas comes exactly nine months after the Archangel Gabriel invited the Virgin Mary to be the Mother of God, an event we commemorate on March 25. The dating of these Feast Days, although interesting, is of minor importance compared to their theological significance. It is fruitful to reflect upon the incarnation of Jesus Christ in the womb of the Virgin Mary as the antecedent to the explosion of joy, caroling, gift giving, eating, drinking, love and family unity that surrounds the birth of the Savior. Perhaps Mary had a sort of private and internal Christmas at the moment of the Annunciation. Maybe she felt the fullness of the world’s Christmas joy inside of her own heart when she realized she had been chosen to be the Mother of God. God could have become man in any number of creative ways. He could have incarnated Himself just as Adam was incarnated in the book of Genesis, by being formed from the clay and having the divine breath blown into his nostrils. Or God could have slowly backed down to earth on a tall golden ladder as a twenty-five-year-old man, ready to walk the highways and byways of Palestine. Or maybe God could have taken flesh in an unknown way and just been found, like Moses, floating in a basket by a childless young couple from Nazareth as they enjoyed a Sunday picnic along the Jordan River. The Second Person of the Trinity chose, however, to become man like we all become man. In the same way that He would exit the world through the door of death, as we all have to do, before His Resurrection and Ascension, He also entered the world through the door of human birth. In the words of the early Church, Christ could not redeem what He did not assume. He redeemed everything because He took on human nature in all of its breadth, depth, complexity and mystery. He was like us in all things save sin. The incarnation of the Second Person of the Trinity was a self emptying. It was God choosing to become small. Imagine a man becoming an ant, while retaining his human mind and will. The man-turned-ant would appear to be like all the ants around him, and would participate in all of their ant activities, yet still think at a level far above them. There was no other way to do it. The man had to learn through becoming, not because insect life was superior to his own, but precisely because it was inferior. Only through descending, only through experience, could the man learn what was below him. All analogies limp, but, in a similar way, the Second Person of the Trinity retained His infused divine knowledge while reducing Himself to a man and learning man life, doing man work, and dying a man death. By such a self emptying, He dignified all men and opened to them the possibility of entering into His higher life in Heaven. The Church’s theological tradition speculates that one of the reasons the bad angels may have rebelled against God was envy. They may have discovered that God chose to become man, instead of the higher form of an angel. This envy would have been directed at the Virgin Mary as well, that Vessel of Honor and Ark of the Covenant who bore the divine choice. God not only became man, we must remember, but did so through a human being, one prepared from her conception to be perfect. March 25 is one of only two days of the year when we kneel at the recitation of the Creed at Mass. At the words “…by the Holy Spirit was incarnate of the Virgin Mary, and became man” all heads bow and all knees bend at the wonder of it. If the story of Christ is the greatest story ever told, today is its first page. O Holy Virgin Mary, we ask your intercession to make us as generous as you in accepting the will of God in our lives, especially when that will is expressed in mysterious ways. May you be our example of a generous response to what God desires of us.